This contractor series large base stand features a cast aluminum base with 4 leveling screws for fast accurate leveling adjustment. The durable precision-ground 2-1/2 in. steel column is 43-1/2 in. high and has a universal motor adapter plate. The reversible feed handle helps the operator use the unit from either side. 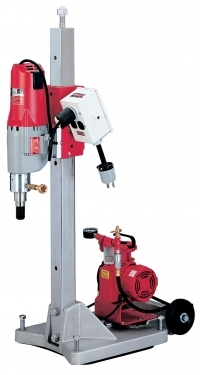 Model 4120-22 comes with model 4096 coring motor, Vac-U-Rig® kit as well as a meter box. The Vac-U-Rig® assembly uses a vacuum pump to apply suction to a large pad mounted on the bottom of the rig. This aids in stability when coring holes. Suggested Dia in Med Aggregate 2"-6" / 6"-10"